We're thrilled to have another fabulous Reading Clean Spotlight! This month, we've chosen STARTERS by Lissa Price. This book is thrilling, adventurous, and full of intrigue! A futuristic, sci-fi thriller that will have you on the edge of your seat, and nobody is to be trusted! 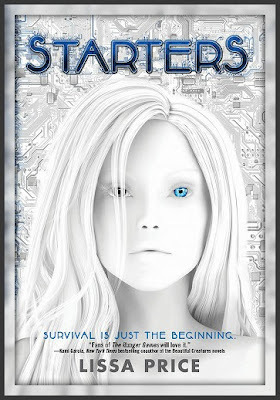 So, if you haven't read STARTERS yet, make sure you sign up to win this book. It came out today, and I have a feeling it will be a best seller! Thanks for the giveaway; this book sounds really good. I love dystopia/sci fi. Thanks so much for the chance to win a finished copy. Congrats to Lissa on her publication day, I hope this book is a huge success! I can't wait for this book! Thanks so much for the giveaway!!! Thanks for giving away Starters! It sounds great! Lissa will be coming to my area at the end of the month ANSI really hope I can make it out to meet her. OMG! I heard really great things about this book. Definitively need to read it. So glad to see Starters getting the spotlight! I loved this book so much!